The Memorial Ground, Borough Road, Birkenhead (Next door to Tranmere Rovers FC). Exit the motorway at junction 4 and take the 4th exit at the roundabout onto Mount Road (B5151). Continue past the double roundabout then turn right at the traffic lights into Mount Road. Exit M53 at junction 3, following the A552 Woodchurch Road towards Birkenhead. Turn right at the traffic lights near the Halfway House pub onto Mount Road (B5151). Turn left at the first set of traffic lights then right at the next set. Go past Tranmere Rovers fc (on your right) and the Memorial Ground is next door. Exit the Queensway Tunnel and bear right onto A552 Borough Road. 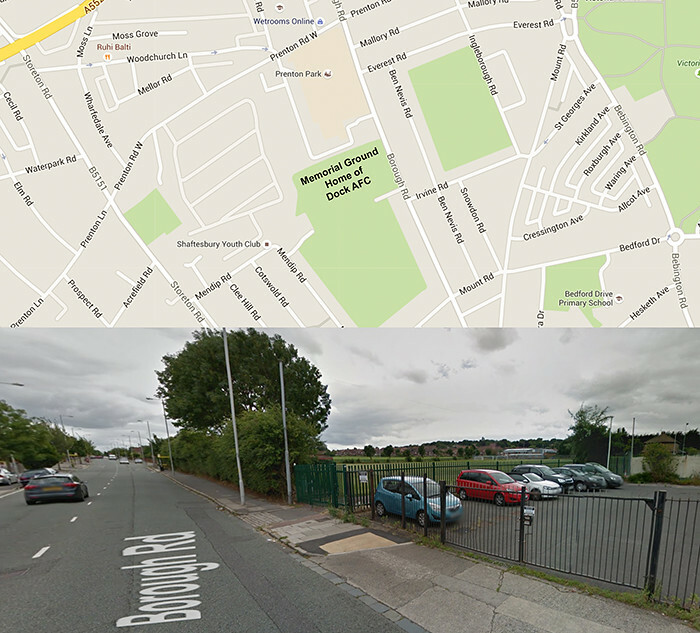 Continue along Borough Road for 1.7 mile past Tranmere Rovers FC and the Memorial Ground is next door. Last updated on December 22, 2015 at 10:49 pm.